In the middle of one afternoon, we caught a group of teenage vervet monkeys stealing hotel towels off an unattended golden cart at the hotel. They snatched the fresh white towels with a quizzical excitement, watched them unfold, shook them, then cast the unfolded cloth aside like an old toy and snatched up an new one. They did it with such glory and efficiency that the high piled cart was quickly disrobed and the surrounding area littered with linen. One of the younger monkeys plopped a washcloth on its head, the cloth spread out, one corner jutting out between its eyes. The monkey sat up and looked around, then began adjusting its new adornment. The scene was too much, we shook with now audible laughter which startled the young monkey causing it to run off and scamper up a nearby tree, wash cloth perfectly balanced like a hat all the while. The days filled with a steady heat—not scorching, but the kind that radiates to every part of your body making it sweat a sweat that instantly evaporates into the dry air. The nights were cold. They brought a chill to the evenings and left a frost on the morning air. 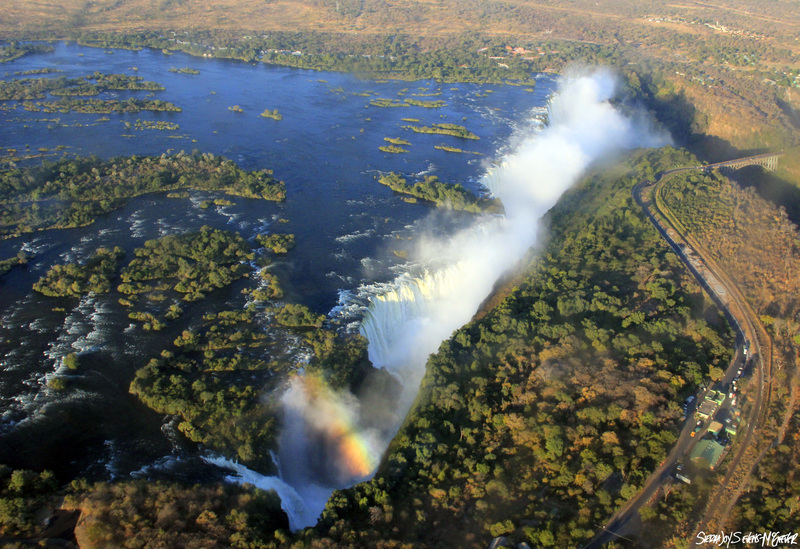 From everywhere we went in Livingstone you could hear the roar of Victoria Falls, the world’s largest waterfall. 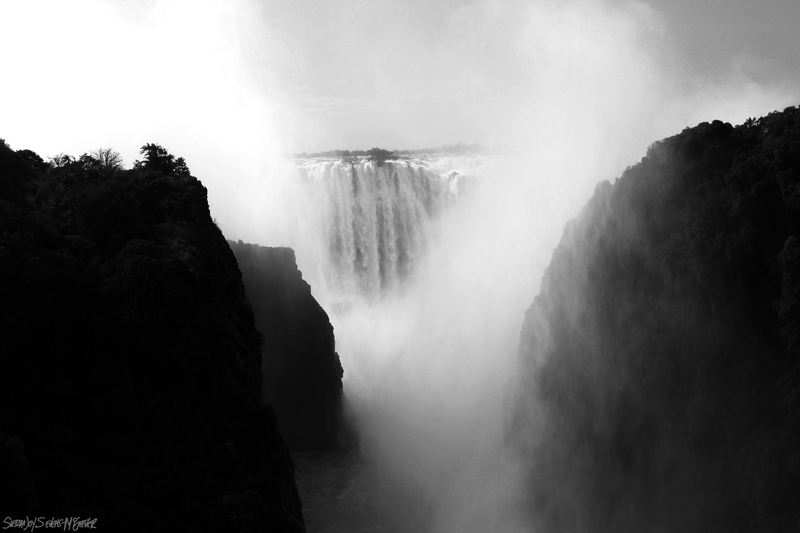 Victoria Falls is known in the local language as Mosi-oa-Tunya, meaning the smoke that thunders. When we went in May, at high water, it was just that: a roar of water behind billowing clouds. The falls appeared and disappeared into a thick mist, swirling up out of the canyon and raining down. We were soaked through, despite a full set of rain gear, and constantly shaken by the force and roar of the pounding water cascading 355 feet down to the boiling green river below. 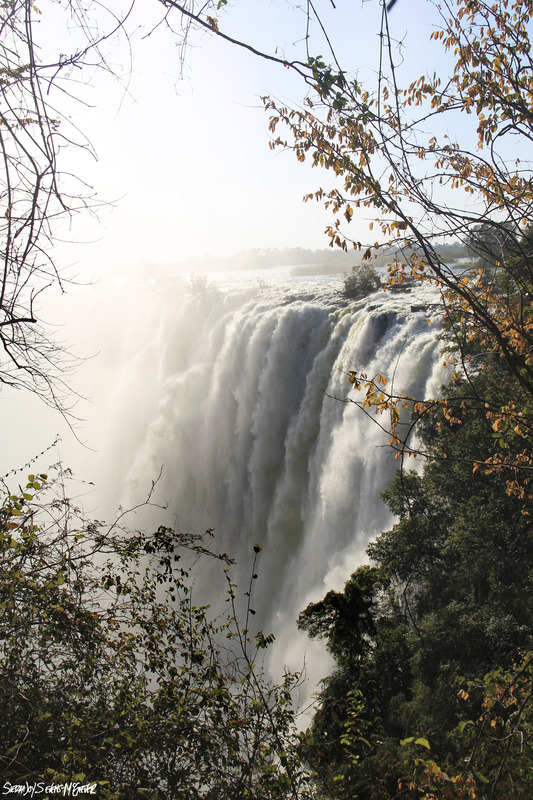 The falls stretch 5,604 feet across and mark the boarder between Zambia and Zimbabwe, both of which have expansive viewing areas for tourists and who offer differing perspectives of the falling sheet of water. Downstream the river proceeds through a series of deeply cut zig-zagging gorges. These cuts in the earth represent previous locations of the great falls as it eroded the earth away through geologic time. From the air, the mighty Zambezi river stretches like a fat blue snake spotted by green islands, meandering through the a landscape of brush and dry thorny trees. 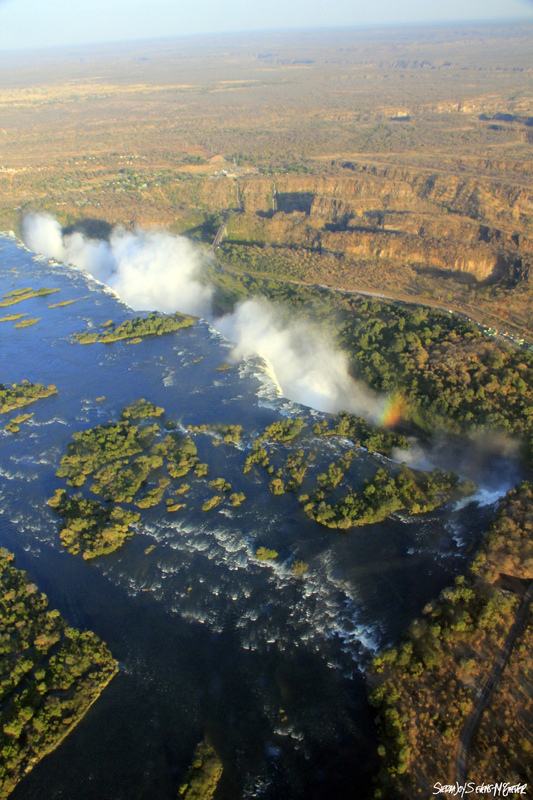 The spray from Victoria Falls can be seen from far upriver and is equally obvious from the air, catching the light and projecting its colors in sequential rainbows. 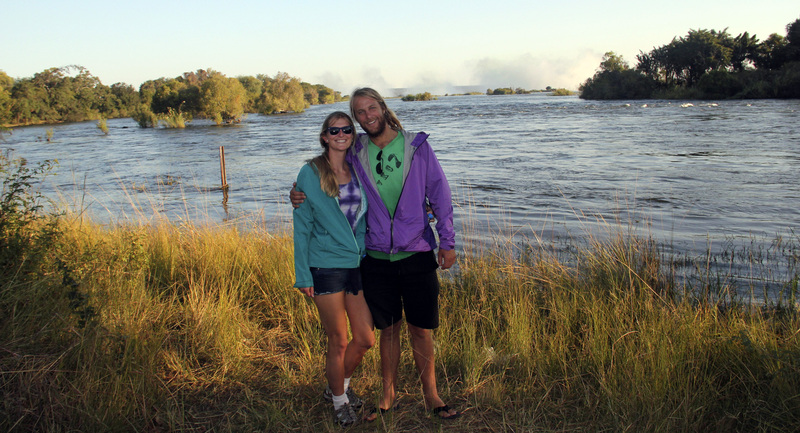 TRAVEL TIP: If you visit Victoria Falls–especially in the spring–bring rain gear! The mist will drench you. 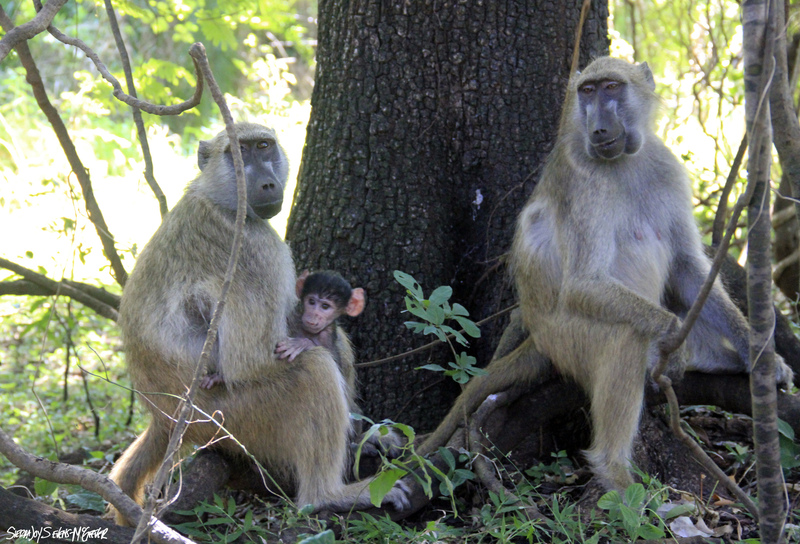 Also, when there are monkey around, keep an eye on your belongings and do NOT feed them under any circumstance–this encourages pesky behavior which can lead to their death. Just upstream of the falls.